Clean look wall adapter with a nicely layout designed to fit any home décor. 2 keyhole mounting slots on back give you the option to mount it on wall tightly. 6 FT extension cable provides more flexibility and convenience. 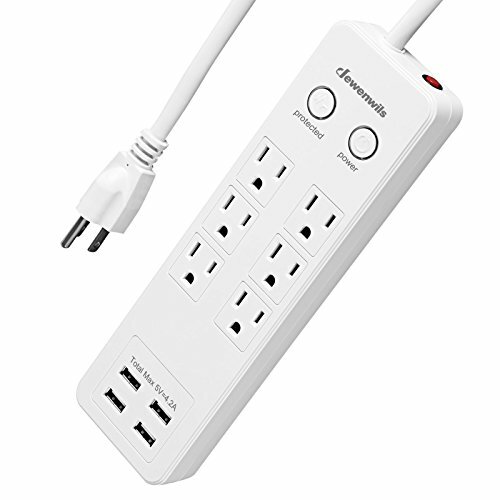 Approved by ETL and FCC, this power strip (15A/1875W) is made of high quality fireproof PC material and 14AWG heavy duty power cord which is the thickest cable you can find for office / household power products. A safe and sturdy charging station provides constant current output for desktop computer, laptop, home theater system and other electronic devices. Multi-Protection System - Safety Guaranteed! 1080 Joules Surge Protector safeguards your electronic devices from power fluctuations, surges and spikes. 15 AMP circuit breaker provides overload protection of Short-circuit / Over-current / Over-voltage / Over-heated. Press the red circuit breaker reset button on side manually to continue using after the cutting off. Power strip splitter with 4 high-speed USB charging ports can help you charge iPhone, iPad, tablets and other smartphones to make sure your electronics are always ready to go. These smart USB ports charge more quickly than traditional USB ports. The output of the 5V 3.1A USB ports is decided by the maximum current limit of your devices and the charging quantity.